Chicago is the best city in the world to see bridges. chicagoloopbridges.com goes into great detail about this proud city’s bridges. However, their logo perplexes me (as seen on their home page and their hats). The water is mysteriously traveling above the bridge. Hats are only 12 bucks (shipping included). 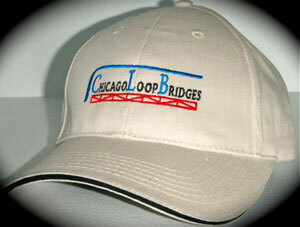 Wear this hat and show civic (or tourist) pride and apparent faith that water travels above bridges in Chicago. Sorry my logo offends your sense of design. The truss at the bottom of the design represents the primary structural element used in the bridges – it does not represent a bridge. Not sure all logos are meant to be taken literally.